Sick? Depressed? A.D.D? Fatigued? Insomnia? Anxiety? Chronic Stress? Constantly feeling off? Have you ever heard of the term allostatic load? In this video I break down the crux of what could be causing some of these issues. If you are looking to get healthy, stay healthy and clean up your body, in 2018 and beyond the info in this video just might be what you need to hear. “Hey! What’s going on? So I wanted to do a video because I’ve been getting ton of questions, people have been messaging, calling, emailing me, etc. about a specific topic and it’s been going on for years and it’s been major problem which I wanted to address and this problem is getting worse and worse… and so I wanted to talk about a specific term which most people don’t really talk about but it’s called “Allostatic load”. An allostatic load is basically a sum total of the stress that’s been put on your body… Now today we are in chronic stress meaning that we are chronically being exposed to toxins to stressors, jobs, traffic, coffee… all these things. And the reason why I say coffee is because coffee stimulates our sympathetic nervous system. It puts you in a fight or flight mode so if your body wants to recover you start to get tired and then you consume more caffeine, you go right back to that fight or flight mode when you should be in a recovery mode. 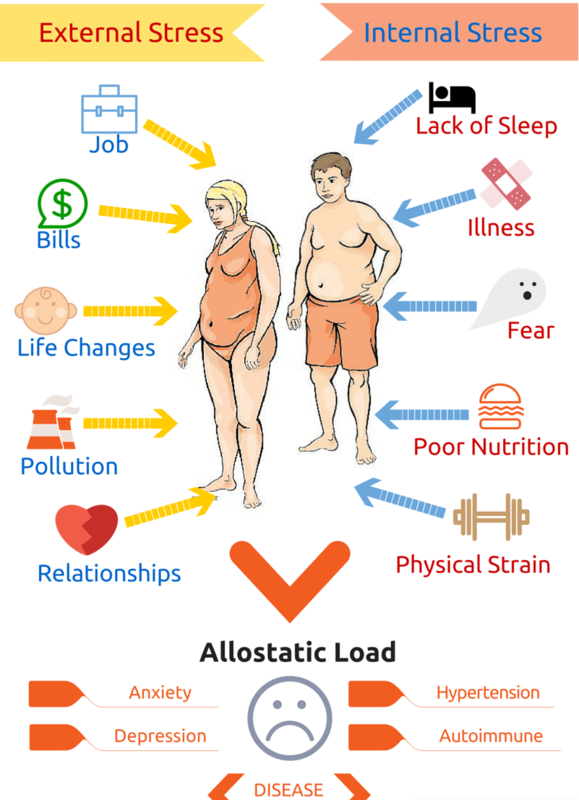 The sum total of all these stressors is what’s called allostatic load. Chronic stress can probably be contributed… most sickness that we are dealing with today is from these chronic stress – toxic exposures, parasite, electromagnetic frequencies, etc..
#1 Limit toxic exposure. You cannot get better if you don’t limit your toxic exposure. – limiting the wifi radiation, processed foods, alcohol. Try to eat all fresh foods, no pesticides. #2 Parasite Cleanse (All natural)- One of the people I always recommend is Hulda Clark’s parasite cleanse because it’s the most thorough, it’s natural… If you try detox and you don’t take care of the initial phase first, you could end up in the worst position. You could mobilise the toxins that are in your body but not excrete them out of your body and then it will get re-absorbed in some time into a worst place. So detoxing and parasite cleanse are extremely important. #3 Improving your Micro-biome – Your micro-biome is your gut flora, it’s where most of your immune system lies… so strong micro flora will be extremely powerful for healing, for preventing diseases. It also helps to consume the toxins so if we eat fermented foods and you have heavy metals in your gut, the fermented food will eat those heavy metals up… Stay away from antibiotics. It’s dangerous to take too many antibiotics and personally I know that it can destroy your gut flora. Your gut flora is directly related to living in a longer, healthy and happier life. If your gut flora is down you’re going to be more depressed. If you are drinking alcohol all the time you know your micro flora is not good, we know that your gut flora is not good. #4 Maximize Mitochondria. Mitochondria are the energy packs inside the cells of your body. We want to energise and maximise them and the first 3 things are going to help you do that… things that I recommend are the Wim Hof breathing, Red Light therapy, Resveratrol, Magnesium, and Detoxing. #5 Spend more time in nature. The frequency of nature is in tuned and harmony with our body’s frequency. It’s healing. If you are exposed to toxins, if you’re being exposed to wifi, think of the tree as a healing wifi. It literally giving of good energy and studies have shown that blood pressure is reduced instantly, stress level, cortisol levels reduce instantly when you spend time in nature. So get more connected with the environment that we are used to being connected with. Right now we are used to being connected with a poisoning and toxic environment and it’s getting more and more poisonous and toxic. Use PEMF. Today I see many people living sub-optimally and it doesn’t have to be that way, all you have to do is know how to navigate the toxic terrain of todays society to heal, recovery and be at peak performance. Check out the video and if you think it can help someone else out go head and share it, if you have a question, leave it in the comment below.